Our Triangle Guild Quilt Show is Sat., Oct. 25 at the Whitney Point Middle School small gym from 9-3. We've been busy planning this for several months. 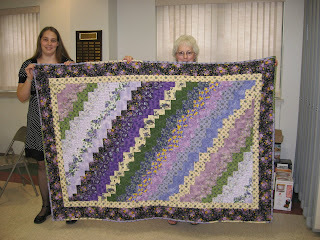 This quilt that I made for my granddaughter Becki for her bridal shower in May will be displayed. It's from the Eleanor Burns Quick Trip book. Becki loves purple and lavenders so the fabric choices were easy. I used a lot of the Vintage Violet collection I had been hoarding for a couple of years. and who is that cute cotton top hiding behind that quilt? hmmmmm? very nice quilt! loving your blog too!